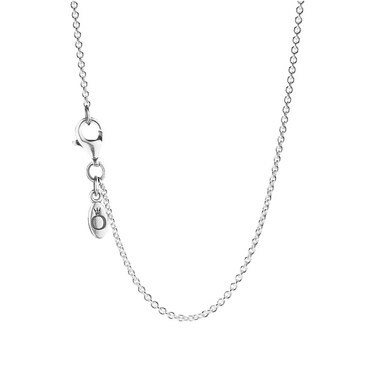 Beautifully enhance your unique PANDORA look with this silver necklace. Handcrafted from sterling silver, this necklace is perfect way to display your PANDORA pendants or PANDORA charms. Lovely Pandora necklace. Arrived very quickly with all the packaging. Very pleased with my purchase of this necklace. Exactly as I expected. Very quick delivery. Was bought as a gift the recipient loved it, as part of necklace with charm. Lovely necklace. Would have liked it just a bit longer but it fine. This is a lovely chain and it arrived quickly. Thank you. My daughter loves it and the length of the necklace is adjustable. I was extremely disappointed with this necklace. It is way too fine and doesn't reflect the price. I will be returning it! Does it come in Pandora box and bag. Is the length adjustable ? Argento Replies: Hello Lesley and thank you for your query regarding the PANDORA 45cm Silver Necklace. I have included below some care guidelines for Pandora jewellery and we hope this helps. How should I care for my PANDORA jewellery? Your PANDORA jewellery should be handled with care at all times. All sterling silver will tarnish over time, but it will happen much faster when it comes into contact with agents such as perfume, salty air, sulphur, skin creams, hairspray, chlorine and acidic skin ph. The amount of tarnishing (oxidation) that occurs is dependent on the skin and care habits of the wearer. Tarnishing is therefore not a manufacturing fault. We also recommend that you do not wear your jewellery whilst bathing, whilst in bed or during sporting activities. Always undo the clasp to remove your bracelet. We recommend the use of our clips to distribute the charm weight into 3 equal sections. Wearing counterfeit charms, or charms by other brands on your PANDORA bracelet could damage the unique threading system and we therefore recommend that only genuine PANDORA charms are worn on our bracelets. How should I store my PANDORA jewellery? Jewellery should be stored away from natural sunlight and heat, in a protective (lined) jewellery box or a tarnish-resistant pouch (currently not available in PANDORA stores). It can also be stored in a plastic zip lock bag made of Mylar or polyethylene. Never use polyvinyl plastic bags, such as bin liners as they contain sulphur compounds, which will make sterling silver tarnish faster. Do not store your jewellery in the bathroom. How should I clean and care for my PANDORA jewellery? In order to care for PANDORA products, we recommend using a polishing cloth regularly to prevent the natural process of tarnishing. Clean your jewellery using lukewarm soapy water and a soft brush, but ensure that your jewellery is never submerged. We do not recommend the use of silver polish and silver dip as it may destroy the delicate oxidised details of your jewellery. We also strongly advise against exposing the jewellery to harsh chemicals, including ammonia, bleach, chlorine and salt water. PANDORA encourages customers to remove the jewellery prior to cleaning, bathing and swimming and ensure that the jewellery is not exposed UV light, hairspray, perfume and cosmetics. Can I use the standard bracelet charms on this chain? Can you please let me know whether there are any necklaces that will take a charm that are 50 cm (20") long as 45 cm, which appears the norm, seems a little short for my daughter preference. Thank you for your help and any suggestions.